If you're looking for a new vacation experience for the whole family, get out of the car and hop onto the train. Everyone can ride the rails in New Mexico. (Tip: Remember to always have your ticket on hand for the conductor.) Step back into a simpler time of the Old West with our locomotives, and see striking views of the vast and contrasting landscape. Or if you just want to get from Point A to B, we have that too. From historic railways to a 21st Century commuter train, New Mexico offers a plethora of destinations for rail fans. 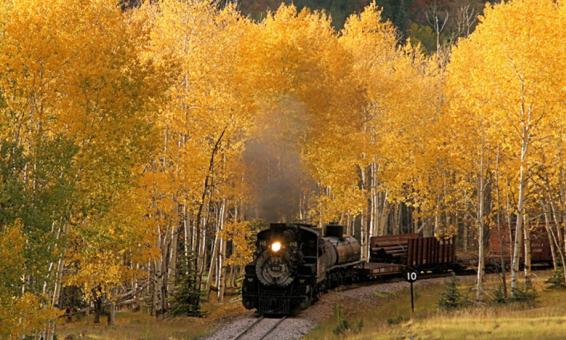 To visit the C&TSRR, head to the village of Chama, 107 miles north of Santa Fe off U.S. 84. The railway was constructed in 1880 as part of the Rio Grande&apos;s San Juan Extension to climb the high mountain passages to the silver mining district in southwestern Colorado. Today it operates as one of the United State&apos;s highest railroads, reaching an elevation of more than 10,000 feet as it chugs though the Cumbres Pass. It&apos;s also the longest narrow gauge railway. The rails are only three feet apart, as opposed to the standard gauge of more than four feet. And the scenery is spectacular. Once the track veers away from U.S. 84, there&apos;s little evidence of modern civilization, giving you the impression you&apos;re seeing the landscape just as it was in the Old West. The New Mexico Rail Runner Express also departs from the Santa Fe Depot, from which it travels south through Albuquerque to the end of its line in Belén. The Rail Runner began offering commuter train service in 2006 and completed its route along the heavily traveled central corridor in 2008. With a style reminiscent of the Super Chief trains that once toured the southwest, the trains boast double-decker seating where passengers can take in views of the Río Grande and Native American reservations while zipping along at a 21st-Century pace. Just hop aboard at one of the train&apos;s dozen stations (you&apos;ll buy your ticket on board) and get ready for adventure. Please note that while the train offers regular service, you should consult the schedule when planning your excursion. The historical AT&SF 2926 steam engine will be the largest 4-8-4 locomotive in operation in the United States and will be available for tourist excursions & charter service once completed. The restoration site is open to the public for free tours (weather permitting) every Wednesday and Saturday from 9:00 AM to 2:00 PM. Group tours can be arranged on any day by appointment. This is a great opportunity to see the restoration work up close and personal. As of 2016, over 150,000 volunteer hours and 2.5 million dollars in contributions have been invested in the restoration and the project is about 90% completed. The huge tender has been fully restored. The annual open house is scheduled on a Saturday in September between NM State Fair and Balloon Fiesta. Check the Events Calendar for additional special events in December. This is a non-profit organization. Visit our website to see how you can help bring an important part of Albuquerque&apos;s history back to life! One of New Mexico&apos;s 13 original Harvey Houses can be found in Belén just south of Albuquerque. From 1908 to 1939 Belén&apos;s Harvey House Dining Room offered hearty fare and good service at reasonable prices to travelers heading into the Wild West. Today, the historic building houses the Harvey House Museum, which preserves Santa Fe Railway and Fred Harvey organization memorabilia. Visit the famous Harvey Girls&apos; dormitories and the Belén Model Railroad Club&apos;s creations. Belén is located 30 miles south of Albuquerque off I-25. The museum is open Tuesday through Saturday from 12:30 to 3:30 p.m.
Hungry? Continue south from Belén to Los Lunas, to the Luna Mansion Restaurant. In 1881, when the New Mexico & Southern wanted to lay track through Antonio José Luna&apos;s hacienda, he asked that the company build him a new house of his own design. The resulting Victorian-style Luna-Otero Mansion is still standing today and operates as a restaurant serving elegant, American fare. Several ghosts are also rumored to haunt the mansion, including the late Josefita Otero who once resided there. In March 8, 1881, in Deming, a silver spike joined the Southern Pacific Railroad to the Atchison, Topeka & Santa Fe Railway, creating the second transcontinental railway. Although there&apos;s relatively little to see where this monumental collision was marked, the town of Deming owes its existence to the railway. Named after Mary Deming Crocker, wife of a railroad tycoon, Deming was officially founded after the meeting of the two railways. A Harvey House quickly followed, and part of that original building still stands next to the town&apos;s Amtrak depot today.